Today in the Decluttering Sentimental Items series, we're decluttering journals and diaries. These may or may not be something you feel is clutter, depending on whether you look back at them from time to time and how much space you have. But if you've got years of journals and you never refer to them and they're taking up space you could use for something else (or just to have a less cluttered home), then these tips are for you. It can be hard to let go of diaries because they hold so many memories in them. We pour out our thoughts and feelings into them. It can be fun to look back at them and see how we've grown or to remember things that we'd forgotten about. Again, if you do that, then they're really not clutter. But if you use your journals more for how they help you process things in the moment, and you never look back at them (or maybe only the most recent one), then over time the old journals can become clutter. If yours are collecting dust in the basement, it may be time to let them go. Some journals can be interesting for future generations to read to understand more about who you are or something you went through. Maybe a major life transition was recorded and your grown kids would enjoy seeing how you handled it. Those can be worth keeping. And if that's the case, you may even want to jot a couple of notes inside the front cover(s) to note the event or time period and the dates. Then store them in a way that they are safe from elements and potential disasters. I have a copy of a journal written by my grandfather about my mom's family immigrating to Canada and it's special to read the stories of all they went through. I'm glad my grandfather kept this journal and that members of the family translated it from Dutch into English so everyone in our family can enjoy it. Similar stories have been recorded on my dad's side of the family as well. It will be great to pass these on to my kids so they can remember this piece of our family heritage. But if you are pouring out your deepest darkest thoughts and feelings, and you don't want anyone else to accidentally read them (or potentially to have to deal with them after you're gone), then now is the time to declutter your old journals and diaries. With journals and diaries, as with many of the sentimental items in this series, it's about choosing to live in the present, rather than the past. If you're struggling with whether to let go of your journals or diaries, think about how they are affecting your life now. Let that be your guide to whether you should keep them or let them go. This doesn't have to be an all-or-nothing process either. Maybe you have a couple of journals that you want to keep that represent very significant times in your life. Keep those treasures and give yourself permission to let go of the others. "I have my grandmother's diaries. She has been gone close to 20 years. I have read a few of them (most from before I was born). I'm not sure if I should keep them or get rid of them. They are currently stored in a bin. Any ideas?" "What kinds of things does she write about? Are they things that interest you or mean something to you? Are there other people in your family who would enjoy them more than you? Do you think you'll read the rest of them? How much space do they take up and what else could you use that space for if you let them go? If you're just holding onto them because they were hers, but they don't really hold a lot of meaning to you, I think I'd let them go (or maybe keep one just for the sentimental value of it). But if they have a lot of family history or shed light on characteristics of your family or something like that, then it's neat to keep them. If you hang onto them, is there someplace you can keep them where you're more likely to read them or other family members would read them (maybe a bookshelf in your living room or in a hallway)? Lots of questions... but only you can make this decision :) Thinking about the answers will hopefully help you make it!" Depending on the type of journal or diary you use, you can probably recycle them (check your local rules). If there's very sensitive information you may want to shred them or bring them to be shredded. You could put a few of them in a frame. Perhaps feelings your wrote after your first date with your spouse. Maybe your wedding day. Or the early days after your first child was born. Even a special vacation. You could scan them and create a photobook of just your favourite pages from all your old journals and diaries. You could add your special pages or 1-2 special journals to your memory bin. "I tossed my journals (mostly from middle school and high school). It felt so freeing! I do have one that I only journal about important things (like the day we found out we were pregnant, or processing the miscarriage). And then I have a book that my husband and I write in each anniversary about how we celebrated, and reflecting back on the year-highs and lows." "I have a couple from high school and I have thought several times over what to do with these. I don't know that I want my kids to read abut the dark times some day. But I also would not mind them reading the happy times like when I first met their dad. So I have pondered this for years. I may see if I can just tear out the fave pages and make a type of scrapbook or something. I don't go through them often, but I want to keep some of it for posterity and the once in a blue moon I do go through it." Only you can decide what you do with your journals or diaries, or those of your ancestors. It can be tough to decide, but hopefully these considerations will help you! 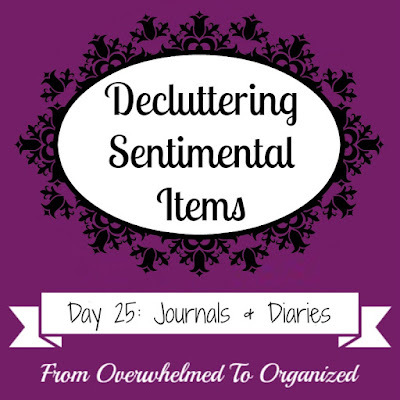 Do you keep your old journals or diaries? Have you let yours go? What tips can you give to someone considering whether to declutter theirs or not? 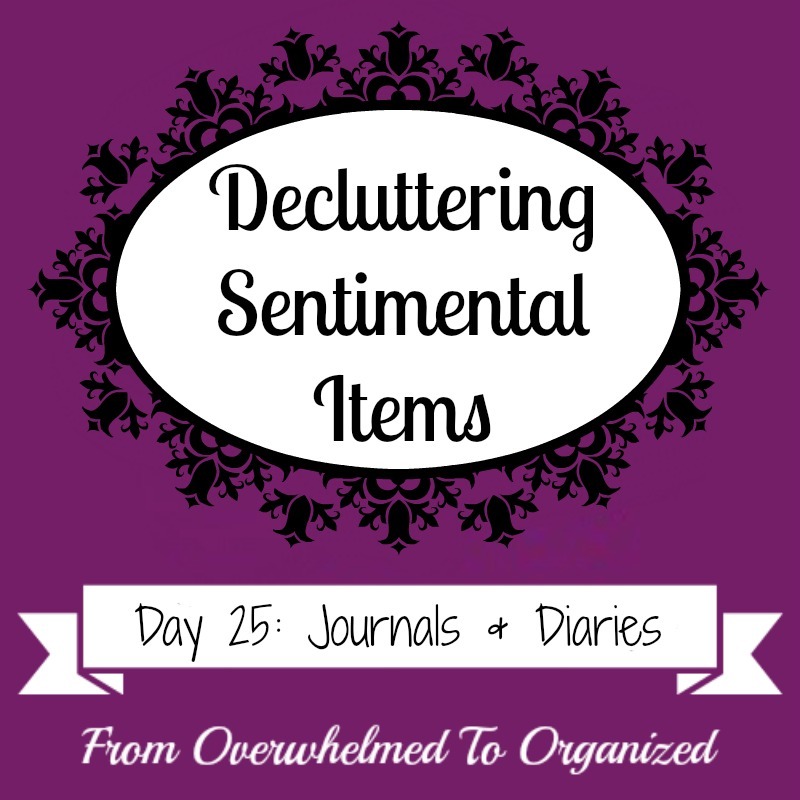 As you declutter your journals and diaries, take pictures and share them on social media using the hashtag #declutteringsentimentalitems so you can inspire all of us to declutter our sentimental items! If you've got a picture of how you displayed or re-purposed journal or diary pages (either yours or your parent's or grandparent's journals), please share it in the comments or on one of the series' social media posts. I'd love to see how you are giving honour and respect to your sentimental items!